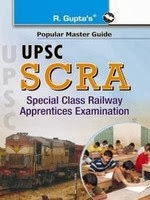 Union Public Service Commission (UPSC) is conducting Special Class Railway Apprentices (SCRA) Examination for the selection of Special Class Apprentices in mechanical department of Indian Railways. @ Passed in the first or second division the Pre-Degree Examination of the Universities of Kerala and Calicut with Mathematics and at least one of the subjects Physics and Chemistry as subjects of the examination. Graduates with Mathematics and atleast one of the subjects Physics and Chemistry as their degree subjects. @Passed the first year examination under the five year Engineering Degree Course of a University, provided that before joining the Degree Course, he passed the Higher Secondary Examination or pre-University or equivalent examination in the first or second division. @ Passed the first year Examination under the three year degree course of a university or the first examination of the three year diploma course in Rural Service of the National Council for Rural Higher Education or the third year Examination for promotion to the 4th year of the four year B.A./B.Sc. (Evening College) Course of the Madras University with Mathematics and at least one of the subjects Physics and Chemistry as subjects of the examination provided that before joining the degree/diploma course he passed the Higher Secondary examination or the Pre-University or equivalent examination in the first or second division.